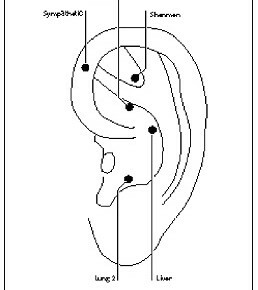 Good time to discuss Auricular Acupuncture. 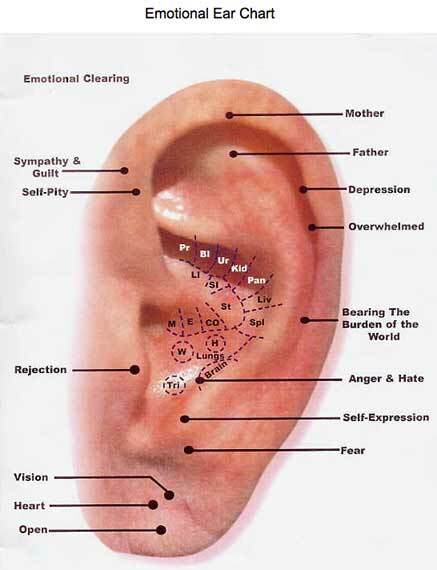 Auricular acupuncture is a microsystem, meaning you can treat disorders of the whole body on one section of the body. 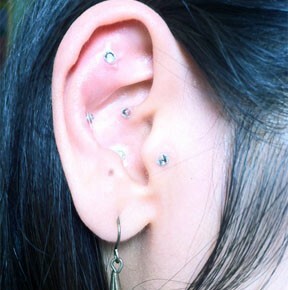 Ear seeds, generally made from Vaccaria plant seeds, are used for continual stimulation of acupuncture points. These are great for chronic pain, de-stressing, mood disorders, release of addiction cravings, weight loss, and colds amongst other issues. 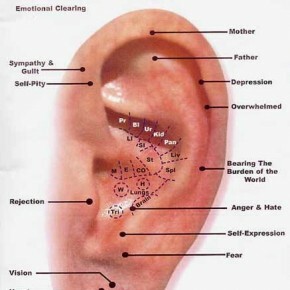 Palpating your ear for sore spots can give you insight into any areas that may need some extra TLC. Auricular acupuncture is most notably used in the NADA protocol for Post Traumatic Stress Disorder (PTSD) and substance abuse detox. In 1985 The National Acupuncture Detoxification Association ( NADA) was established to promote education and training within substance abuse and alcohol and drug services. The five point protocol was mainly developed to assist detoxification, withdrawal and relapse prevention from drugs and alcohol. It has been quite effective in the reduction of stress, and was even used in many hospitals and clinics in NYC to treat people affected by the 9/11 tragedy. The treatment has an affect on the organ/body functions concerned with cleansing and balancing the body. Any excessive emotion may cause disease to its associated organ. The NADA protocol addresses the main body organs and emotions. The five points for this treatment are: sympathetic, shenmen, kidney, liver, and lung. Shenmen is associated with the heart and joy; Kidney is associated with fear; Liver is associated with anger, and Lung is associated with grief. Responds to fight or flight autonomic response. Helps with muscle spasms and intestinal cramps. Anxiety gives way to calmness. Shen Men Point – known as the spirit gate. Helps to bring the energy of the heart into balance. Impatience and moodiness gives way to calmness. Kidney Point – known as the essential source of energy. Alleviates toxicity in the kidneys. Is related to life force and longevity. Fear is the associated temperament. Fear anguish and paranoia give rise to awareness and gentleness. Elevates toxicity in the blood and liver. This energy is known to keep everything running smoothly. Stabilises impulsive behaviour and mood swings. Helps tendons and ligaments, stiffness and soreness of limbs. Anger, rage and depression give rise to balance and kindness. Alleviates toxicity in the immune system. Helps respiration and skin function. The lungs are the very balance of life force and are a nourishing organ. Helps with mentally letting go. Promotes oxygenation of the blood. Grief and sadness give way to courage and hope. 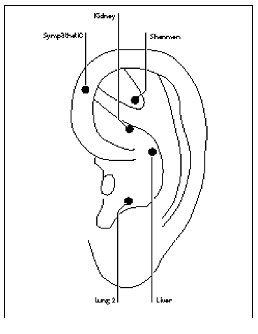 In researching Auricular Acupuncture I came across a great article on the combination of acupoints and essential oils. Dr Gary Young developed a technique known as Neuroauricular Treatment. It involves application of essential oils to the rims of the ears, the back of the skull and along the spine. Wonderful addition to ear beads. Do you make these yourself. Do you sell them.